B. Vohnsen is with the Institute of Physics, Aalborg University, Pontoppidanstraede 103, DK-9220 Aalborg Øst, Denmark. S. I. Bozhevolnyi is with the Mikroelektronik Centret, Technical University of Denmark, Building 345 east, DK-2800 Lyngby, Denmark. Radiation and collection characteristics of four different near-field optical-fiber probes, namely, three uncoated probes and an aluminum-coated small-aperture probe, are investigated and compared. Their radiation properties are characterized by observation of light-induced topography changes in a photosensitive film illuminated with the probes, and it is confirmed that the radiated optical field is unambiguously confined only for the coated probe. Near-field optical imaging of a standing evanescent-wave pattern is used to compare the detection characteristics of the probes, and it is concluded that, for the imaging of optical-field intensity distributions containing predominantly evanescent-wave components, a sharp uncoated tip is the probe of choice. 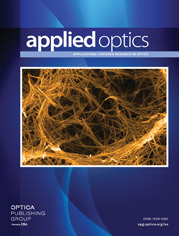 Complementary results obtained with optical phase-conjugation experiments with the uncoated probes are discussed in relation to the probe characterization.